TFF Associate in 2005. She was a board member 2007-2009 and joined our board again in late 2011. 1. World Food Programme (WFP), Egypt Country Office: Writing an article for the Food and Nutrition Bulletin on the Government of Egypt’s Flour Fortification Programme. 2. European Commission (EC): Designing and teaching a one-day seminar on Logical Framework Approach to Report Writing for European Union (EU) grant beneficiaries, including compliance procedures, narrative + financial reporting. 3. World Health Organisation (WHO): Editing reports and public information materials for the Advocacy and Communications Unit; Writing Progress Reports for the Mental Health and Psychosocial Services Support Project funded by EC. 4. Local Aid Coordination Secretariat (LACS): One-on-one tuition in report writing for key LACS staff member; Drafting/editing minutes taken in meetings between Palestinian Authority ministries, donors and other stakeholders. 5. WFP, oPt: Designing and teaching a six-week Report Writing in English course (including situation analysis reports, correspondence, minutes, style guidelines). 6. United Nations Relief and Works Agency (UNRWA): Designing and teaching a six-week Report Writing in English course (including project proposals, analytical reports, style guidelines). 7. Palestinian Education Ministry (MoEHE), Ramallah: Designing and teaching a 10-week Report Writing in English course focused on the Ministry’s Five-Year Plan and new reporting procedures; Writing two manuals: “Guidelines for Reporting” and “Language and Style for Reporting”. 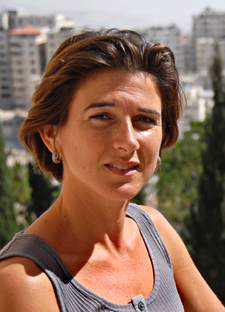 October 2006 – May 2007: Communications and Reporting Officer, Holy Land Trust, Bethlehem. • Interview conducted with Sami Awad, Director of Holy Land Trust, Bethlehem, published in PRISM, (16) March/April 2009. • MA thesis “A Shared Human Identity – the Foundation of a Peace Culture” published in The World Peace Journal, (1) 2008. • BBC Radio Jersey Afternoon Show: 40-minute interview on my consultancy work with the United Nations and the Palestinian Authority, broadcast live April 2010. • “Personal View”: 40-minute interview by BBC Radio Jersey on my work and life in the Palestinian territory, broadcast August 2008. • “Give Peace a Chance”: 40-minute interview by BBC Radio Jersey on peace journalism, broadcast January 2007. • “Visions of Peace and Reconciliation in Israel and Palestine”: talk given at the Bergli Bookstore, Basel, Switzerland, December 2006. • “A Vision of a World at Peace – the UN and Civil Society in the Global Peace Process”: talk given at the World Goodwill Seminar, London, November 2004.